Go! Daily Defence recipes give your dog whole body preventative care for life. They are nutrient-packed and nutritionist-recommended to give your dogs the preventative care they need to stay strong and healthy for life. 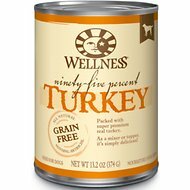 This Turkey Stew is prepared with premium-quality turkey, antioxidant-rich fruits and veggies and essential omega oils. 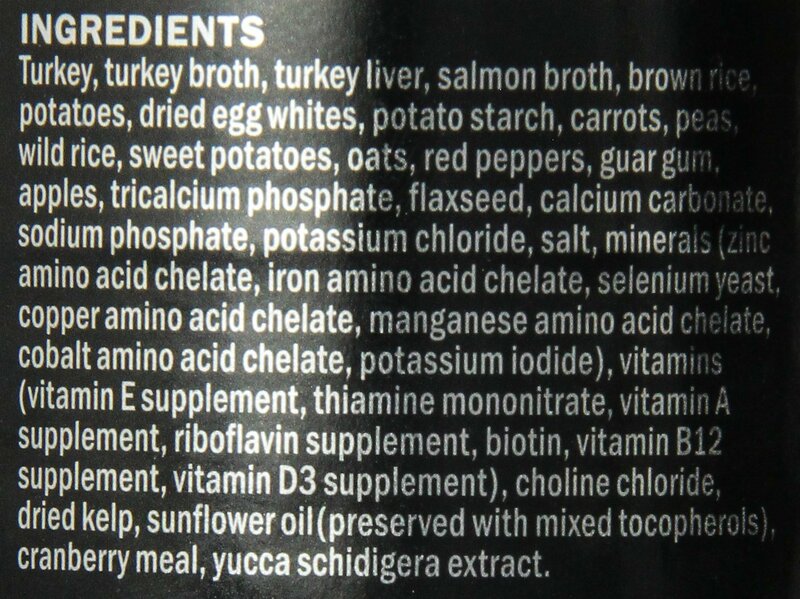 Turkey, Turkey Broth, Salmon Broth, Turkey Liver, Brown Rice, Dried Egg Whites, Potatoes, Peas, Carrots, Sweet Potatoes, Wild Rice, Potato Starch, Oats, Guar Gum, Red Peppers, Apples, Flaxseed, Sodium Phosphate, Tricalcium Phosphate, Calcium Carbonate, Sunflower Oil (Preserved with Mixed Tocopherols), Potassium Chloride, Minerals (Zinc Amino Acid Chelate, Iron Amino Acid Chelate, Selenium Yeast, Copper Amino Acid Chelate, Manganese Amino Acid Chelate, Cobalt Amino Acid Chelate, Potassium Iodide), Salt, Vitamins (Vitamin E Supplement, Thiamine Mononitrate, Vitamin A Supplement, Riboflavin Supplement, Biotin, Vitamin B12 Supplement, Vitamin D3 Supplement), Choline Chloride, Dried Kelp, Cranberry Meal, Xanthan Gum, Yucca Schidigera Extract. 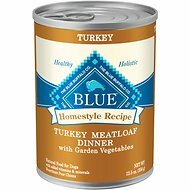 Adult: Feed 1 1/4 - 1 3/4 cans per 15 lbs of body weight per day. 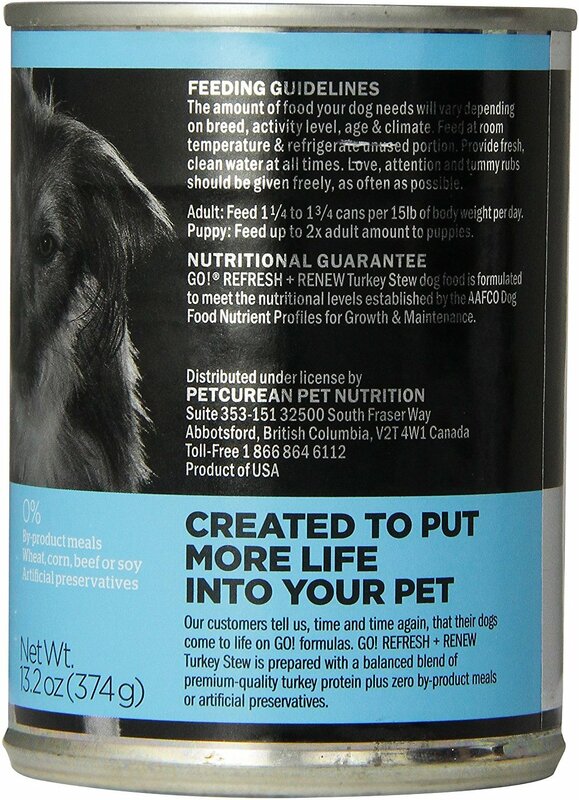 Puppy: Feed up to 2x the Adult amount for puppies. I've purchased Go! products before and have always been impressed. The company puts great care into their ingredients and manufacturing process; a full nutrient analysis is available on their website. My dogs, a schnoodle and a Norwegian elkhoud/setter mix, always eagerly devour these foods. They're both senior dogs, but quality foods such as this one keep them healthy and energetic. 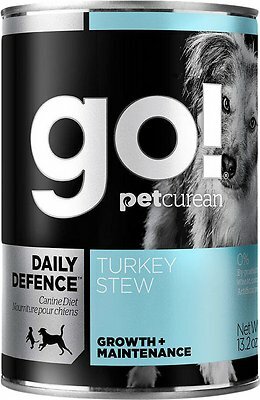 Helps my dogs food allergies. I searched for 2 years before I found this food. My dog had food allergies that had her chewing herself up with the itching. Since I have been feeding this food her skin has healed and her hair has grown back. It may cost more for the food but well worth it with the healing my dog has experienced. 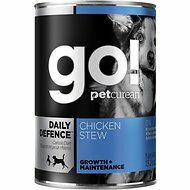 We wanted a great quality soft food as our dog is getting older and has issues with his teeth. Chewy.com has the best prices I could find. My German Shepherd loves all 4 flavors of the stew. Does not like the pates. And Ted is a discriminating eater. But he also has allergies, and this food doesn't aggravate his itchies. The first time I gave Go! canned food to my 2 chesapeake's they loved it!! And I loved how great it made their coat look--and their breath even smelled better. I deviated from this can food for a while when I couldn't find it locally...big mistake. Not only would they not eat the other brand, I noticed their coat looked dryer. From now on my boys eat Go! canned food! You couldn't ask for a better product to feed your dog.